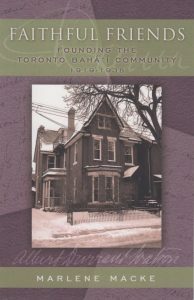 Marlene Macke, an author and dramatist, has published a history about the Toronto, Ontario, Canada, Bahá’í community in honor of its eightieth anniversary. 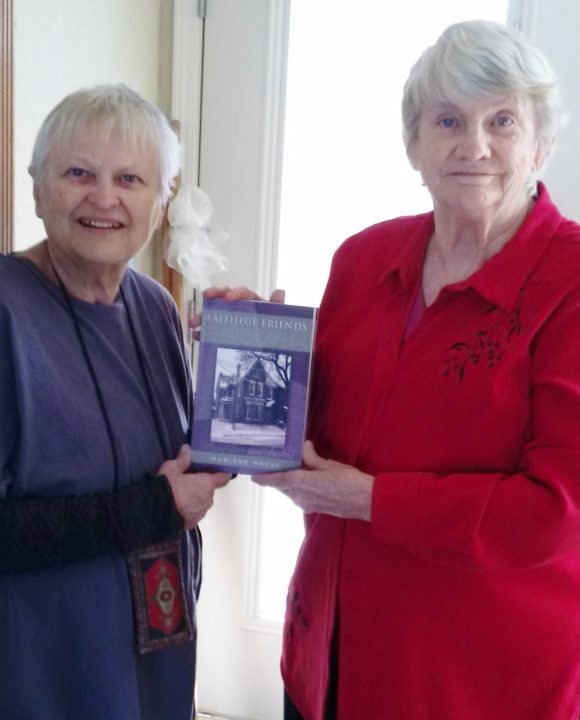 Called Faithful Friends: Founding of the Toronto Bahá’í Community 1919–1938, Marlene’s book is the first published history of a Canadian Bahá’í community, which she hopes will inspire other writers to research and publish histories of their own communities. The book was officially launched at the Toronto Bahá’í Center on May 16. That event was followed by three additional readings. The book is now available from the Toronto, Canada, Bahá’í Bookstore and is featured on the bookstore’s website. Marlene Macke’s book provides intriguing glimpses into the social context during the 1920s and ‘30s in the fledgling Toronto Bahá’í community. Letters and personal interviews illustrate the loving connections from the many visitors who nurtured and readied the early believers to be self-sustaining. References from books, interviews, Bahá’í newsletters and personal anecdotes reveal inside views of their efforts, and excerpts from annual reports track the goals accomplished. This book is inspiring, informative and well-documented. What unites a retired submarine captain, a museum curator, and a beekeeper? What would housewives and insurance executives, students and senior citizens find in common? Marlene Macke recounts for the first time in remarkable detail the lives and personalities of the Bahá’ís in the early days of the Bahá’í community in Toronto. This is a history of the diverse lives of some fifty individuals who took the preliminary but vital steps to establish Bahá’u’lláh’s vision of the oneness of humanity as the essential ingredient for a peaceful world. Marlene Macke, who lives in Southwestern Ontario, has written a number of works: a biography Take My Love to the Friends The Story of Laura R. Davis, a play entitled Tabreez, dramatic readings on the history of the Bahá’í Faith, and several essays on the plays of William Shakespeare. Congratulations to Marlene Macke for the publication of Faithful Friends.